More helpful than a bed rail . . . Unlike bed rails, the Bedside Assistant does not need to be raised and lowered. The adjustable space between the handles allows the user to get in and out of bed while the handles remain in place. Legs come up through the sitting space. The space can be up to 27" on a twin-or full-size bed, up to 32" on a queen- or king-size bed. The handles may be covered with standard-size pillowcases for a taut fabric surface. Makes any bed a safer bed . . .
. . . 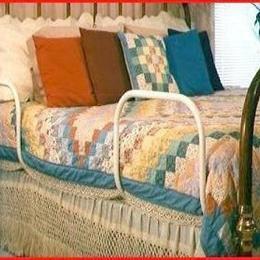 Especially for anyone who uses a cane or walker or who feels dizzy or unsteady as they get in and out of bed. Designed by an engineer for his wife who has MS, the Bedside Assistant was tested by people with weakness from Parkinson's, injury, medication, hypertension, chemotherapy and stroke. The Bedside Assistant is stable in all directions and can be firmly pulled, pushed, lifted and leaned on. The Bedside Assistant is easy to install on any bed you use: at home, visiting friends and family, even at hotels.